Enriching Womens’ Lives or Shattering Them? 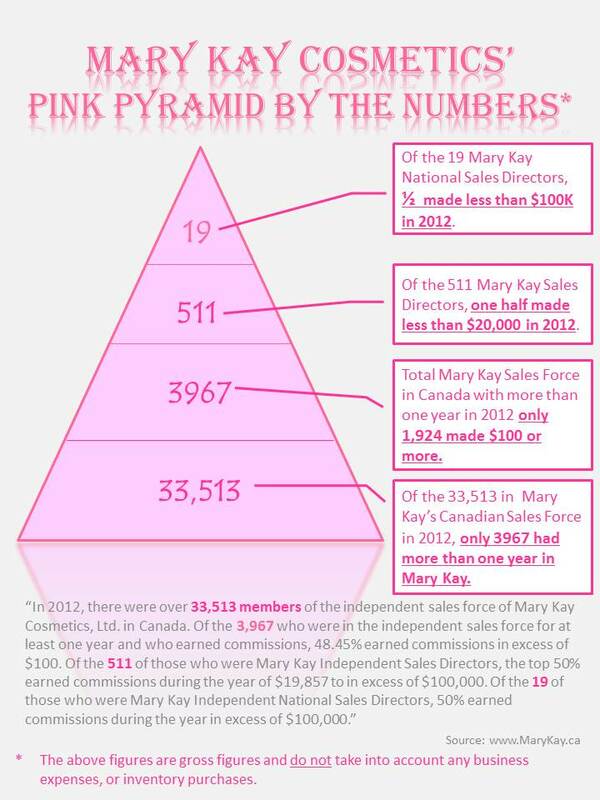 Shedding Light On Mary Kay Cosmetics’ Pathetic Pink Pyramid – F.A.C.E.S. In most multi-level-marketing companies, the vast majority of the so-called “top earners” are those who are rewarded when they harvest new recruits. In this regard, Mary Kay Cosmetics, with its predatory tactics, is no different than any other MLM company. When one moves past the manipulation that Mary Kay uses on women to lure them into the pink fog and examines the real numbers of just how few within Mary Kay Cosmetics are really making “executive incomes,” it is quite startling. In the United States, as a privately held company, Mary Kay Cosmetics is not required to reveal the real earnings of its sales force. In Canada, however, the laws are different. As a result, one can get a glimpse of the truly dismal pyramid-like nature of Mary Kay Cosmetics on the company’s Canadian website. That’s only ten (out of more than 33,500 women) who earned “executive incomes” in 2012. Worse yet, of the 33,517 Canadian consultants more than half earned less than $100 in 2012. Half of the 511 earned less than $19,857 in commissions in 2012. Behind all the hype and promises of “enriching womens’ lives,” the fact is, Mary Kay Cosmetics appears to be nothing more than a multi-level-marketing company seducing women with smoke and mirrors and leaving the vast majority of them broke–if not broken.